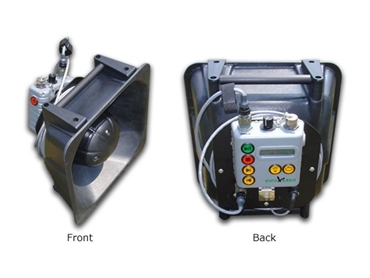 L100 bird repellers are a line of lightweight and portable acoustic bird control devices distributed by Bird Gard Australia. Operators can target a location and send out up to 135 decibels of high-intensity variable sound in a directional manner. Sound dispersion to the rear and sides is minimal making it neighbour-friendly. L100 bird repellers find application in efficient agricultural pest management. The complete system weighs about 6.8kg and comprises of a speaker, handheld control unit/ Mp3 player and battery charger. The device utilises COTS rechargeable Li-ion batteries in a custom battery cartridge.